Cover postmarked Casablanca September 23, 1920 to Paris (no b/s), early airmail label tied by Casablanca cds, franked Scott 51 and 52 used before airmail stamps were issued in Morocco. 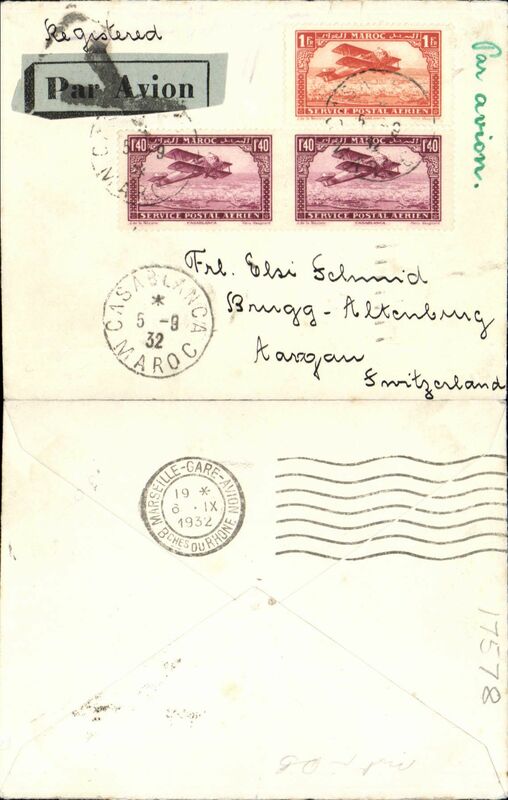 Latיcoטre airmail covers of 1919 are exceptionally rare and those of 1920 are scarce. Ironed vertical crease, does not detract. Lingnes Aerienne Latיcoטre, Casablanca postmarked November 26, 1922 to Paris (no b/s), franked Scott C5. The Latיcoטre years (1919-1927) represent the beginning of the golden age of French airmail, and these covers are the only artefacts still available (and affordable) from this exciting period in aviation history. Lingnes Aerienne Latיcoטre, airmail cover postmarked Casablanca November 26, 1922 to Paris, b/s, ms 'Par Avion', franked Scott C5. The Latיcoטre years (1919-1927) represent the beginning of the golden age of French airmail, and these covers are the only artefacts still available (and affordable) from this exciting period in aviation history. 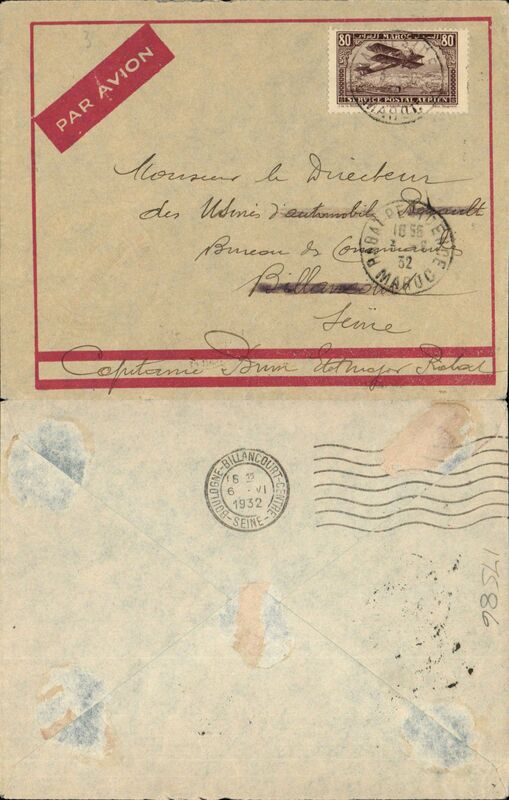 Cover postmarked from Casablanca December 15, 1922 to Paris (no b/s), attractive red bordered Lingnes Aerienne Latיcoטre airmail cover with various route and rates printed verso, franked Scott C5. Cover postmarked Casablanca February 3, 1923 to Juan les Pins (France) (no b/s), attractive red bordered Lingnes Aerienne Latיcoטre airmail cover with various route and rates printed verso, franked Scott C5. 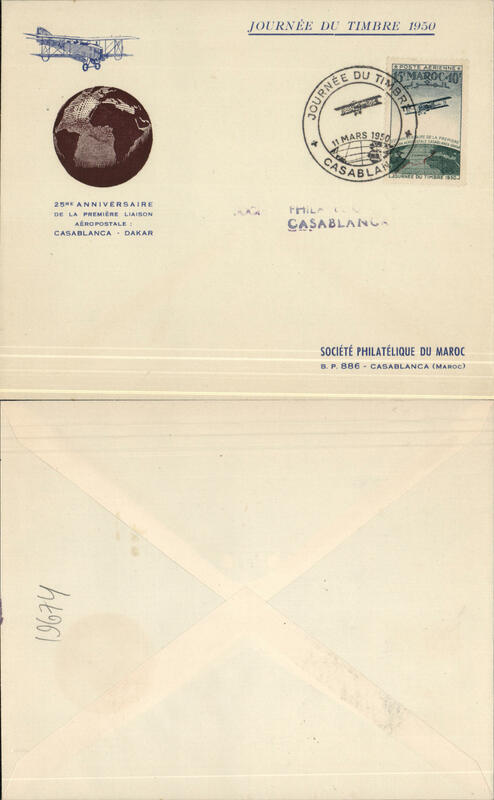 Cover from Agadir with military postmark May 1, 1923 to Paris (no b/s) but with Casablanca transit b/s 7 May 1923. Attractive red bordered Lingnes Aerienne Lacotiere airmail cover with various route and rates printed verso, faint military cachet, franked Scott 51. The Latיcoטre years (1919-1927) represent the beginning of the golden age of French airmail, and these covers are the only artefacts still available (and affordable) from this exciting period in aviation history. Lignes aיriennes Latיcoטre, registered cover postmarked Casablanca May 28, 1923 to Paris (no b/s), attractive red bordered Lingnes Aerienne Lacotiere airmail cover with various route and rates printed verso franked Scott 42 + C7, rare Latיcoטre label advertising air travel to Morocco. According to French airmail expert Gיrard Collot these were seldom used. The Latיcoטre years (1919-1927) represent the beginning of the golden age of French airmail. These covers are the only artefacts still available (and affordable) from this exciting period in aviation history. 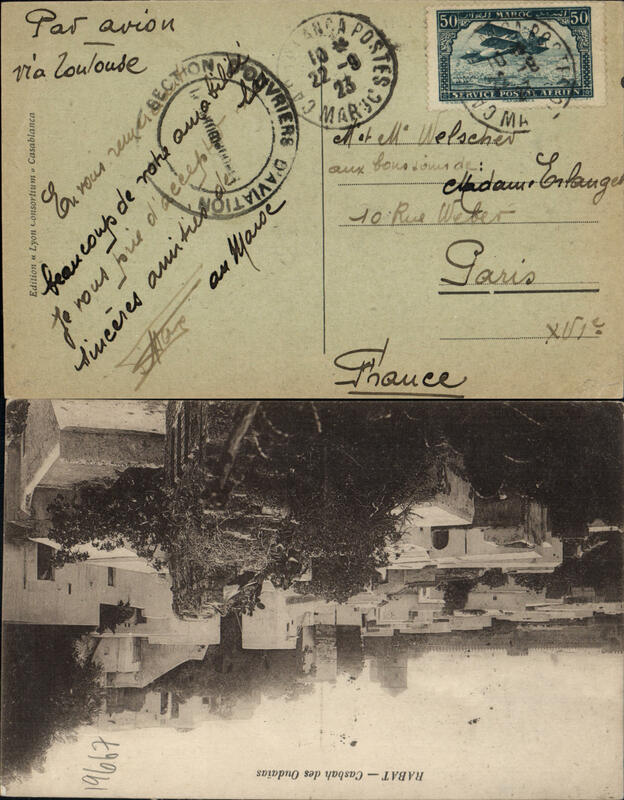 Cover postmarked Casablanca August 11, 1925 to St-Gervais (France) with faint August 15 (? ), 1925 b/s. Circular military handstamp “T.O.M. [Thיatre des operations militaries] Service Automobile Casablanca”. Unusual airmail label. Scott C3. Faint vertical crease and nibbled rh edge. Casablanca September 22, 1923 to Paris (no b/s), sepia PPC showing Rabat township, franked Scott 3, round handstamp cachet of the Sections d’ouvriers d’aviation. Nice early airmail item. Registered cover postmarked Rabat December 18, 1923 to airmail specialist Francis J. Field in England (no b/s). Scott C10. The Latיcoטre years (1919-1927) represent the beginning of the golden age of French airmail, and these covers are the only artefacts still available (and affordable) from this exciting period in aviation history. Early flown internal cover Tangier to Casablanca, bs 24/12, red bordered Lingnes Aerienne Lacotiere envelope, with various route and rates printed verso, franked 75c air canc Tanger/Cheri**en cds. 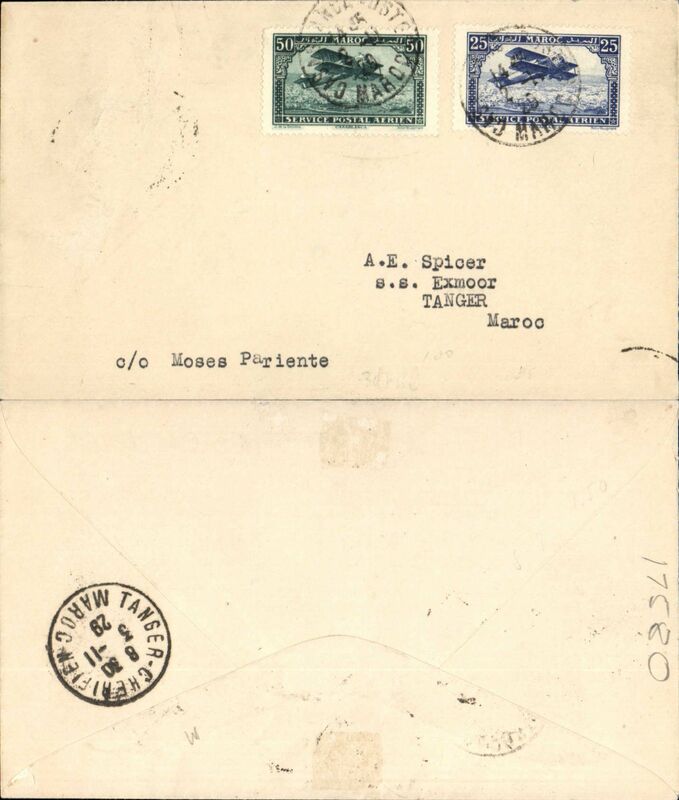 Cover postmarked Rabat February 23, 1924 to airmail specialist Francis J. Field in England (no b/s). Scott C7. The Latיcoטre years (1919-1927) represent the beginning of the golden age of French airmail, and these covers are the only artefacts still available (and affordable) from this exciting period in aviation history. Cover postmarked Casablanca July 31, 1924 to Billancourt (France) (no b/s), attractive red bordered Lingnes Aerienne Latיcoטre airmail cover with various route and rates printed verso, franked Scott C5. Lignes aיriennes Latיcoטre, cover postmarked Casablanca July 10, 1925 to Toulouse (France), partial b/s, franked Scott C2 (pair). The Latיcoטre years (1919-1927) represent the beginning of the golden age of French airmail. These covers are the only artefacts still available (and affordable) from this exciting period in aviation history. 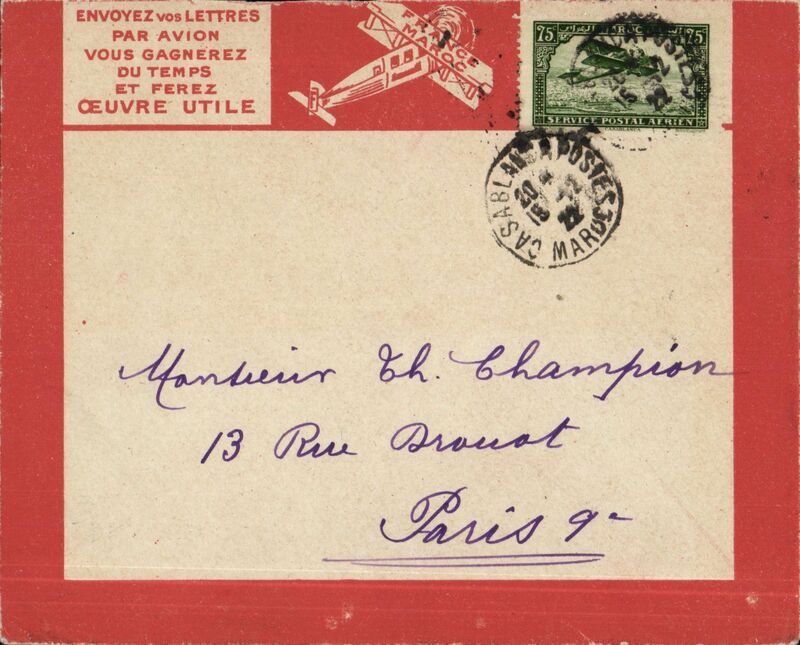 Military flown mail MOROCCO-FRANCE, cover with Postes aux Armיes postmark (January 15, 1926) to Paris (no b/s). This cover was likely carried by military airplane since it has the handstamp “A.F. 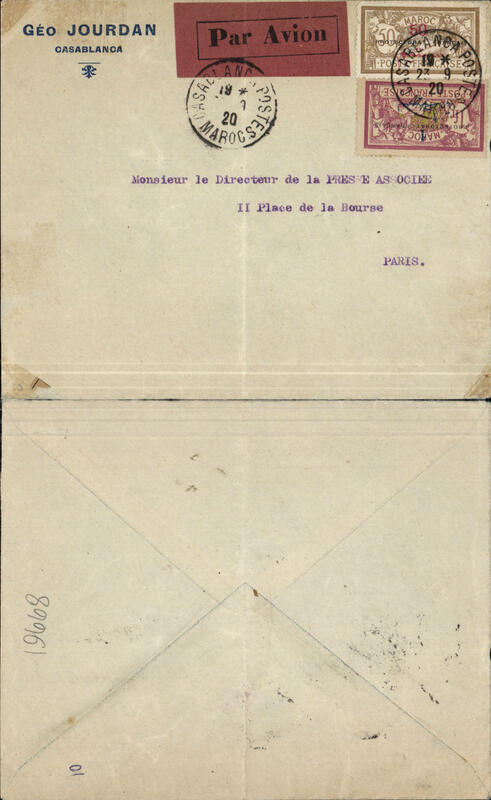 Aviation miitaire – Escadrille” and “Courrier par avion” which is not seen on mail from the military sent by the usual Latיcoטre service. Very beautiful calligraphy. One corner missing and another bent. A little worn but rare usage. 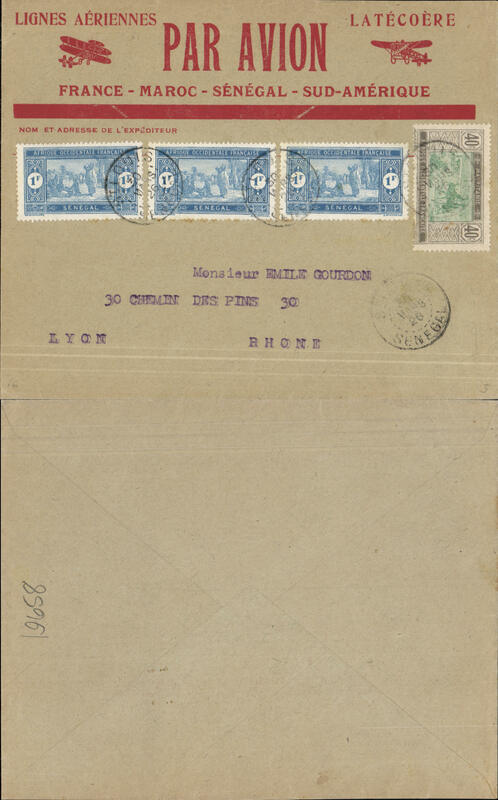 Cover postmarked St-Louis (Senegal) March 30, 1926 to Lyon (no b/s). Scott Senegal 113 and Mauritania 36. 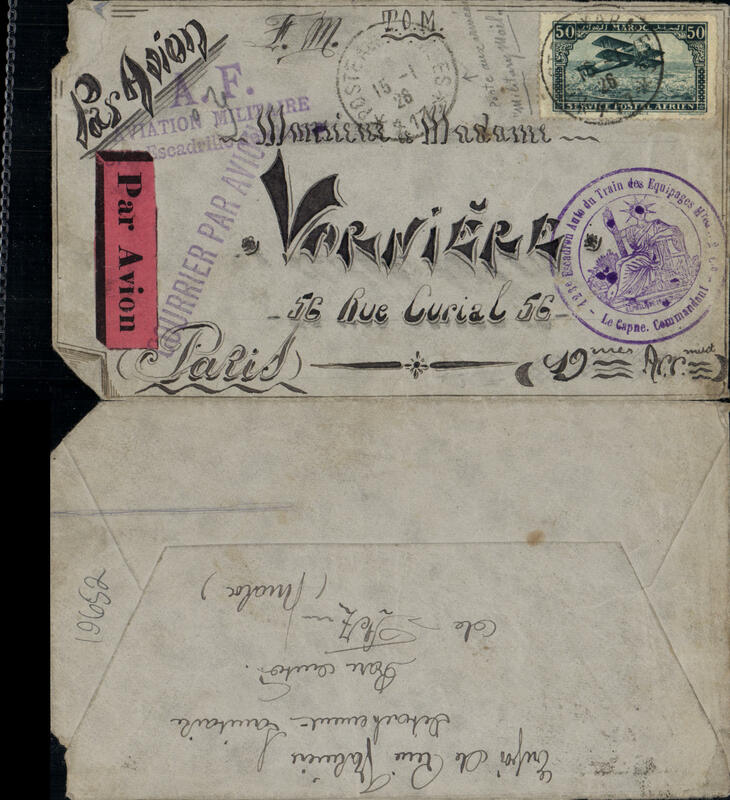 Beautiful and rare variety of Latיcoטre airmail cover advertising the extension to South America. These late airmail covers are much scarcer than the usual red-bordered ones. Lignes aיriennes Latיcoטre, cover postmarked Casablanca May 8, 1926 to Berlin with receiving stamp 12 May 1926. Shell Oil airmail label. Scott 53 + C5, small hole on flap, does not detract. The Latיcoטre years (1919-1927) represent the beginning of the golden age of French airmail. These covers are the only artefacts still available (and affordable) from this exciting period in aviation history. 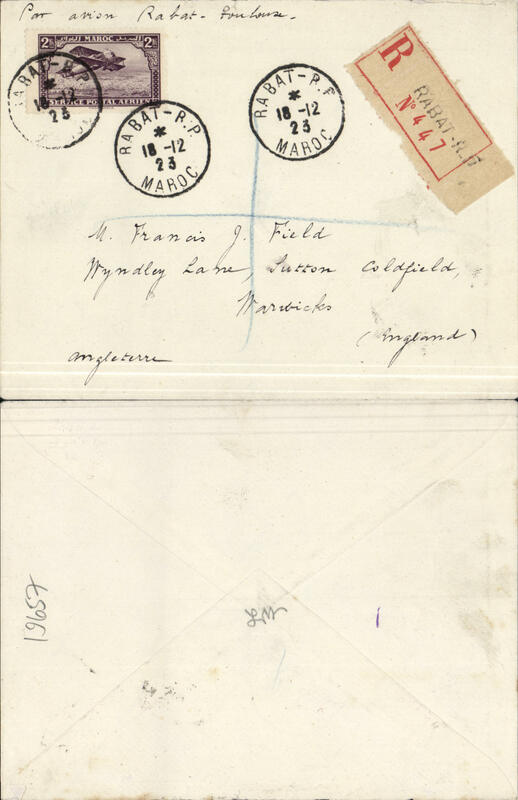 First acceptance of Morocco Agencies mail for India, for carriage on Imperial Airways's first regular weekly Cairo-Basrah flight, neat "Union Jack" cover addressed to Capt Smye, c/o Post Master, good strike Karachi, bs 17/4, franked Morroco Agencies/3f opt on GB 2/6d and Morroco Agencies opt on GB KGV 1/2d, canc BR. PO Tangier cds, ms endorsements "Per 1st through flight Cairo-India" and "Printed Matter". Persia prevented completion of Middle East-India route so mail was delivered to Karachi by surface. A very scarce item in fine condition. 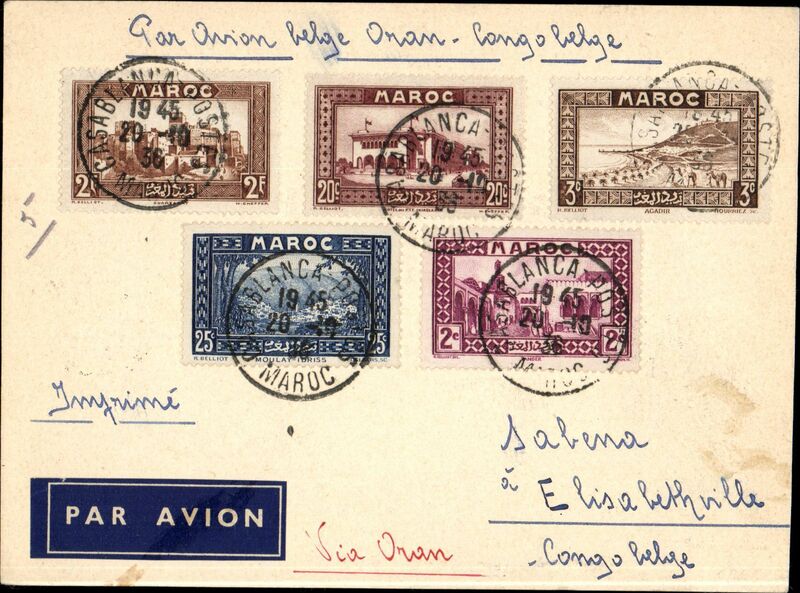 Early Compagnie Gיnיrale Aיropostale (CGA) service from Toulouse and Marseille to Casablanca (Morocco) and Dakar (Senיgal), Casablanca to London, no arrival ds as usual, bank of British West Africa cover franked 2F50 Scott C1 (block of 4), C3, C6 and C7, violet framed "Par-Avion/By Air Mail" hs and Moroccan advertising cachet for the Rabat fair. 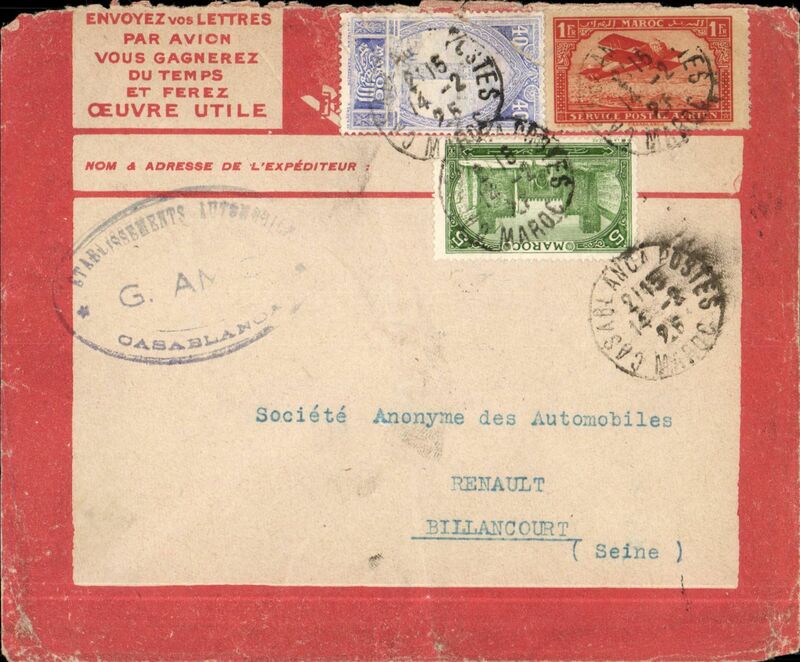 Compagnie Gיnיrale Aיropostale (CGA) service from Toulouse and Marseille to Casablanca (Morocco) and Dakar (Senיgal), Marrakech to Paris, no arrival ds, via Casablanca 25/5 transit cds, registered (Marrakech label) cover from a soldier serving with the 'Regiment de Tirailleurs Marocains', franked 80c air x3 Scott C6, canc Marrakech cds, large blue handstamp of 62e regiment de tirailleurs marocains. Tirailleurs was a term used by the French as a classification for infantry recruited in the various French colonial territories, particularly Algria and Senegal. Nice item. 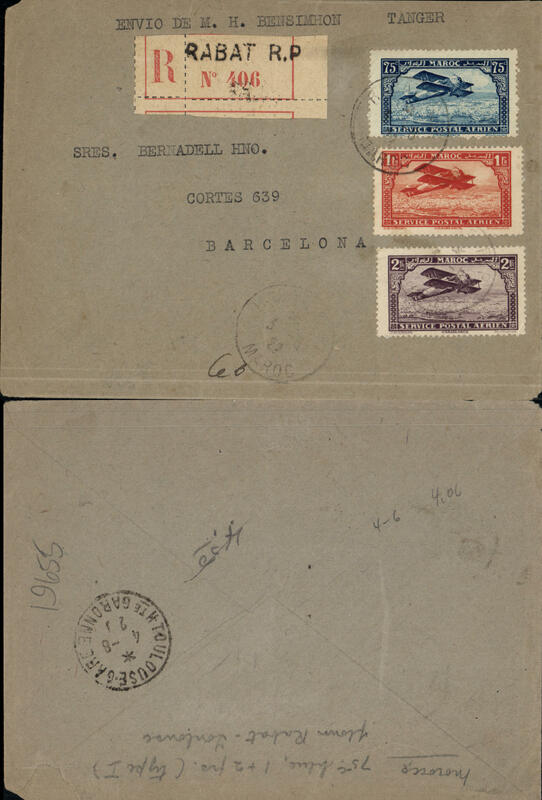 Lignes aיriennes Latיcoטre, registered (label) cover postmarked Rabat August 3, 1928 (or 1922) to Barcelona (no b/s) with Toulouse transit b/s August 4, 192?, plain light grey cover franked rare Scott C4 (blue 75c) + C7 and C10. Since Barcelona was the stop before Toulouse on the route from Casablanca, it is strange that the cover reached Toulouse (to be sent back to Barcelona on the return flight ?). The Latיcoטre years (1919-1927) represent the beginning of the golden age of French airmail. These covers are the only artefacts still available (and affordable) from this exciting period in aviation history. Compagnie Gיnיrale Aיropostale (CGA), early internal airmail from Casablanca to Tangier, bs 3/11, plain cover franked 75c Scott C2 + C3. Likely flown from Casablanca to Rabat and then by surface to Tangier since this city was not a stop on the airmail route. An uncommon early internal airmail in particularly fine condition. Compagnie Gיnיrale Aיropostale (CGA) service from Toulouse and Marseille to Casablanca (Morocco) and Dakar (Senיgal), Rabat to Billancourt (France), b/s June 6th, scarce cream/red framed envelope with red/cream imprint airmail etiquette, franked 80c Scott C6. Rabat is 50 mils NE Casablanca. Compagnie Gיnיrale Aיropostale (CGA) service from Toulouse and Marseille to Casablanca (Morocco) and Dakar (Senיgal), Casablanca to Aargau (Switzerland), no arrival ds, via Marseilles, 6/9 transit cds, plain registered cover franked 3F80 Scott C7 + C8 (pair), ms 'Par Avion', grey blue/black airmail etiquette cancelled by black framed cross Jusqua applied in Toulouse or Marseilles, see 'Jusqu'a Airmail Markings', McQueen I, p101. By the early 1930s, both Marseille and Toulouse were used as final stops for the line. 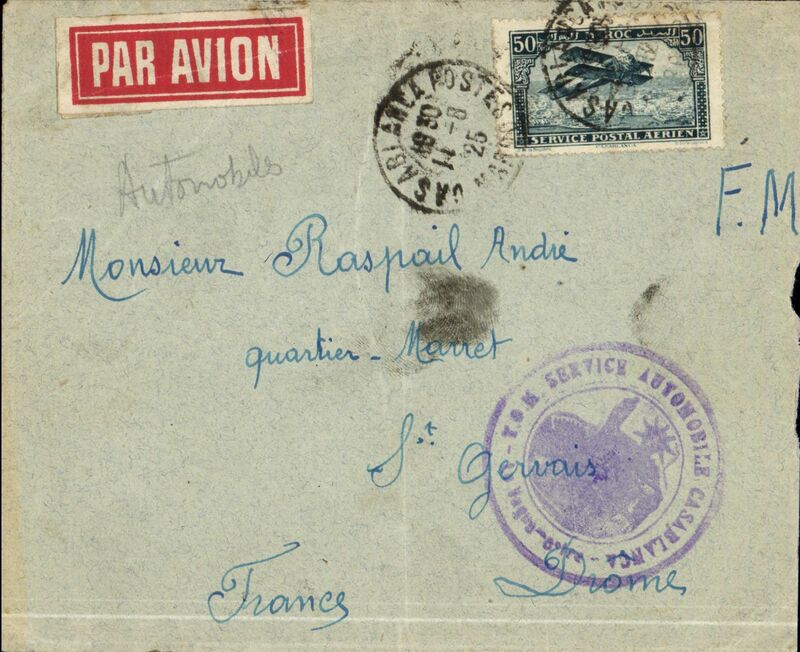 Compagnie Gיnיrale Aיropostale (CGA) service from Toulouse and Marseille to Casablanca (Morocco) and Dakar (Senיgal), Casablanca to Berlin, no arrival ds, Marseille-Gare 10/2 transit cds, pale grey airmail cover franked 2F50 Scott C17 with margins and plate number, violet framed 'Par Avion' hs cancelled by black cross Jusqu'a applied in Marseilles, fine strike rare two line “Par Avion Postal Direct/ Casablanca-Toulouse” not listed in McQueen, grey blue/black airmail etiquette. Nice item in particularly fine condition. Air France/Air Afrique, Tetuan to Elisabethville, bs 28/11, via Alicante TPO 17.11, Madrid 17/11 and Marseilles 18/11, rare and likely first Spanish Morocco acceptance for carriage to the Belgian Congo on the Air France/Air Afrique Paris-Marseilles-Algeria-Leopoldville extension to Elisabethville, a Victor Nawratil cover franked 4PF, canc Certificado/15 Nov 35/Protect Espanol/Tetuan boxed registration ds, ms's "Correo Aereo (Marseille crossed out) Oran-Congo Belge" and"Via (Bruxelles Belgium crossed out) Oran". A complex and ambitious intended routing, even for the experienced Nawratil. The ms 'Via Bruxelles' was inapproptriate; there was no air route to Oran; and the first new Sabena service to Elisabethville had left before this cover reached Marseilles, so it was carried by the second Air France/Air Afrique Marseilles-Algeria-Elisabethville flight. This notwithstanding, and knowing Nawratil, this is almost certainly a first acceptance from Spanish Morocco for the extended route. Ex Clowes. 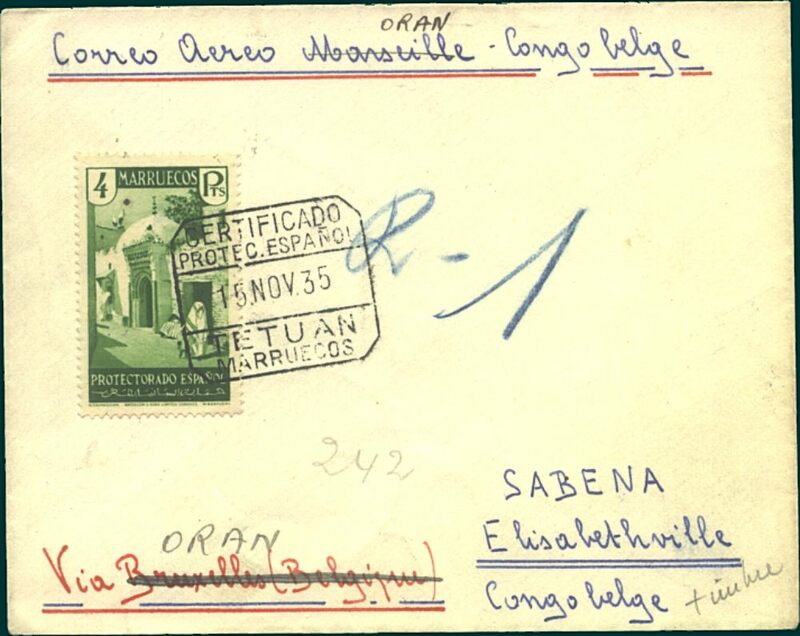 Scarce Morocco acceptance for Elisabethville for carriage on the accelerated Sabena service from Brussels to Elisabethville, Nawratil cover franked 2F50 canc Casablanca cds, ms 'Par Avion Belge Oran-Congo B elge'. Few, if any, other Moroccan acceptances for this flighjt exist. Morocco to England, no arrival ds, early cover flown on the Latecoere Rabat-Toulouse service, plain cover franked 50c air canc Rabat RP/11.12.26, ms 'Par Avion Rabat-Toulouse'. 1cm closed top edge tear. 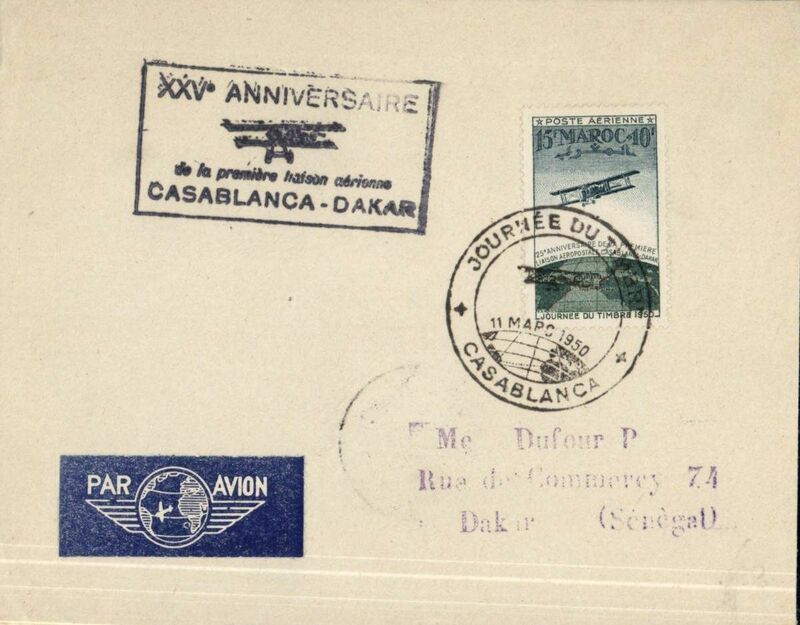 25th anniversary of the Casablanca-Dakar first flight, cover postmarked Casablanca 11 March 1950 and addressed to Dakar with arrival b/s March 15th. Special airmail stamp issued for the occasion. 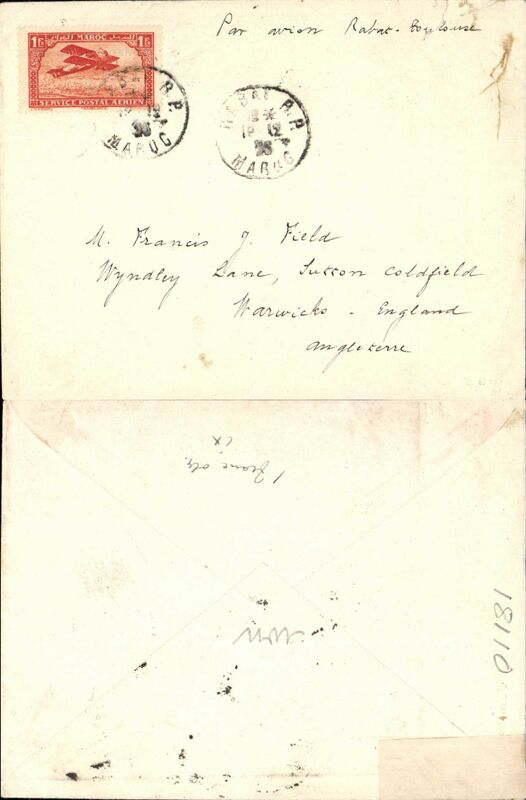 The late arrival date shows that this cover was not flown. It was in 1925 that the first airmail between Casablanca (Morocco) and Dakar (Senegal) was flown by Latיcoטre. Acceptance for Austria 7th April 1955 Walsen-Kinderdorf balloon flight, souvenir card franked Morocco Agencies QEII 2 1/2d, canc Tetuan cds. 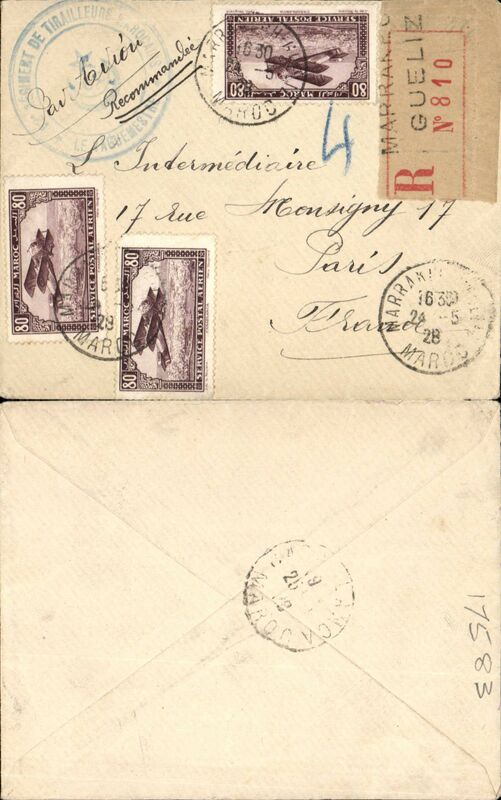 Spanish Morocco acceptance for Vienna-Zurich balloon post, franked 2Pts, canc Tetuan 17 Mar cds.